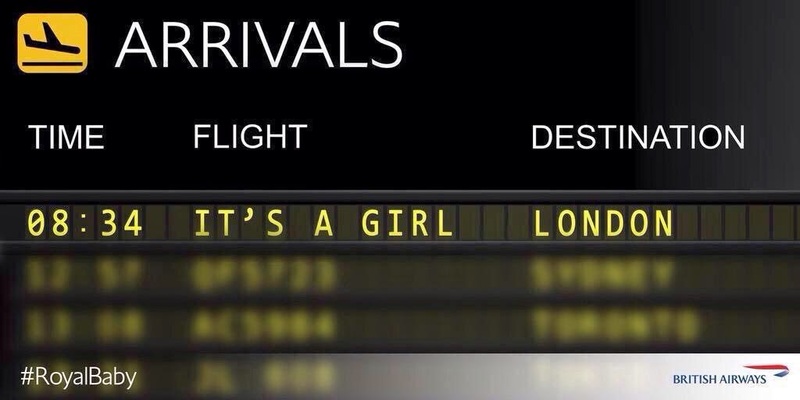 When you saw "Special Delivery", did you think I was talking about the new Royal Baby? Well, you're partially right. But first, I want to show you the lovely contents of a parcel I received several weeks ago from Jo of Jo's Jumbled Jardiniere Blog! I came across Jo's blog when I first started blogging and what's so touching about her blog, is her personal account of her life, travels and time spent with friends & family. Jo's blogging style, reminds me of how blogging started off. It's about writing. It's about reading. It's about documenting. She's very detailed, both in her writing & pictures, and when you read her posts you feel as if you're there! She's not concerned about having a vast number of followers. She's not concerned about sponsored posts. She comments when she can, and when she does it's very heartfelt. When I received her parcel, I was very touched. She hand wrote a 7 page letter to me. She also explained each gift. Everything has meaning. I'm still blown away! 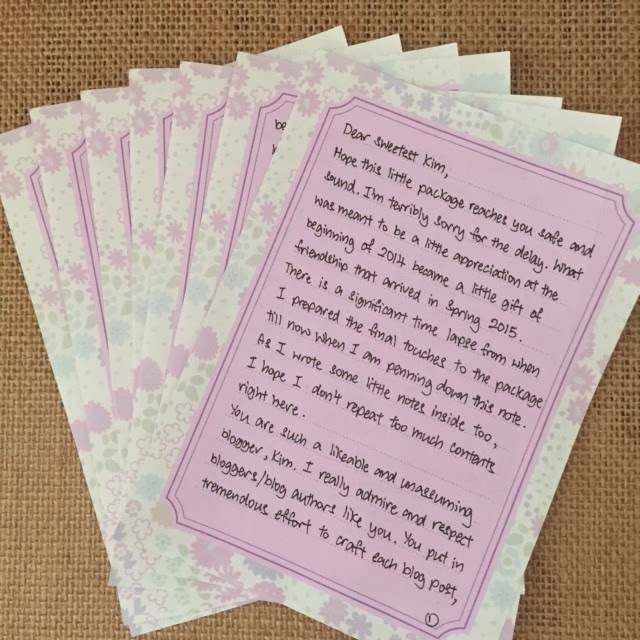 When was the last time, you received a hand written note? You just don't find that level of CARE anymore. Below are the gifts she sent me. Thank You So Much Jo! You're a true friend. This nail polish is so beautiful! 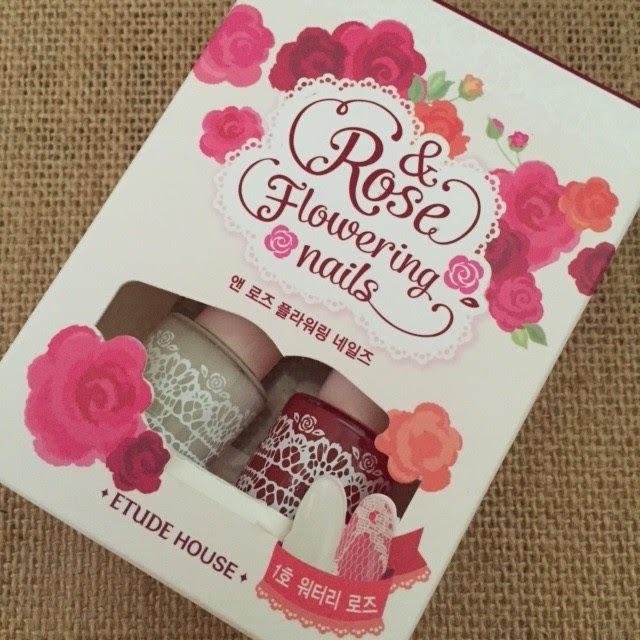 I've never tried Etude House nail lacquer! 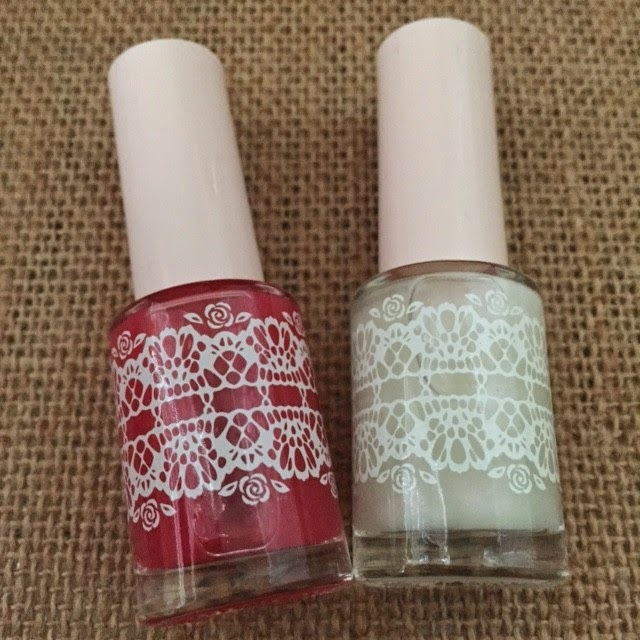 The lace decals that come with it are are precious. I can't wait to give them a try. Thank You! Do you know, I've never tried false eye lashes before? I just recently started watching YouTube beauty vlogger videos and thought I would give them a try this year. The quality of lashes have come along way. I've always tried to remain "natural" (especially as a contact lens wearer), but lashes really do enhance the eyes. So I will definitely give these a try :) Thank you for sending them to me. I'm so glad you liked my Elvis Presley posts (while visiting Memphis, Tennessee). The whole experience was very enlightening. I definitely want to travel more. I've been to Nevada, Florida, Texas, Washington, Mississippi, South Carolina, Tennessee, Ohio, Illinois, and Virginia. There's so much more to see! Currently I'm remodeling my home, so trips have been placed on the back burner. But in a couple of years, I plan on resuming :) These sticky notes are just too cute! I can't wait to use them. 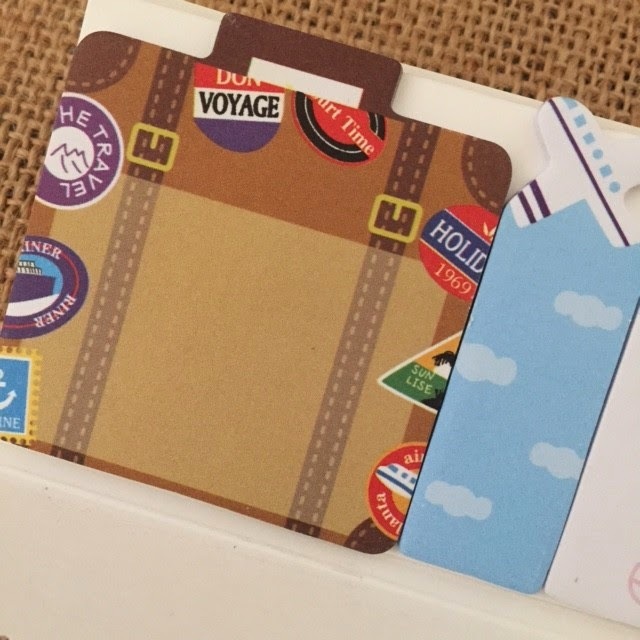 I love the suitcase and overall travel theme of each sticker. They will be a joy to use! I've heard so many great things about Sasa! 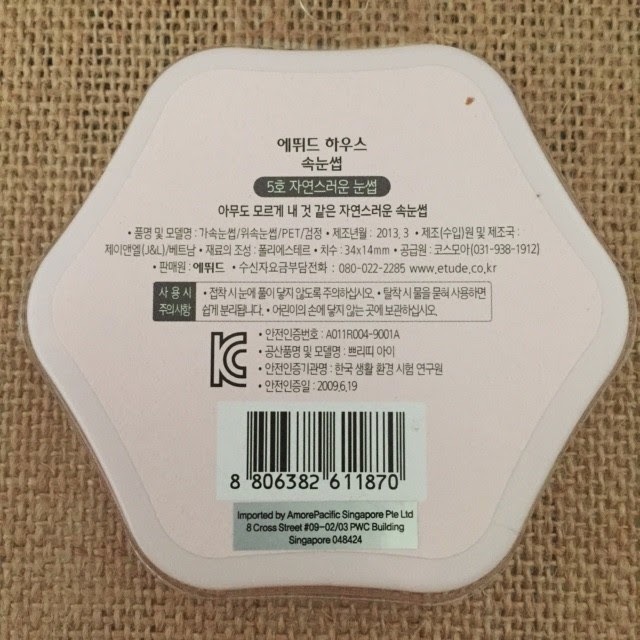 I shopped Sasa.com online and they have a vast assortment of all kinds of Asian beauty treats. As you know, I love trying Asian brands (and really International brands in general). The colors in this palette are beautiful. They will be perfect for Spring & Summer. Three things I love! I was so touched that you thought of this and had it made. You don't know this, but I've always loved charm bracelets. 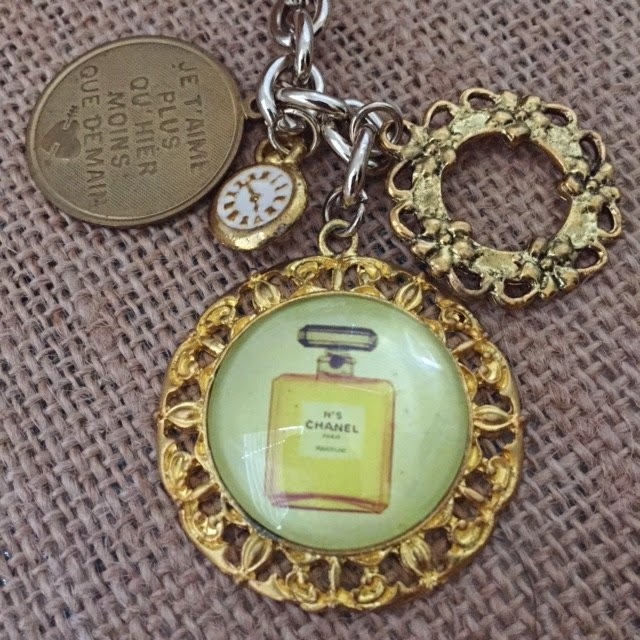 Every charm, usually has a meaning to the wearer. It's personal. That's why one displays so much joy while wearing one. I LOVE any and everything Alice In Wonderland. It represents to me imagination, dreams, creativity, a journey, helping others, evolving, changing and SO MANY other beautiful things. That's why I love the story so. I've always been a fan of Chanel (especially vintage Chanel...I have a love/hate with Karl Lagerfeld hahaha), so to have her classic perfume bottle displayed is a joy. 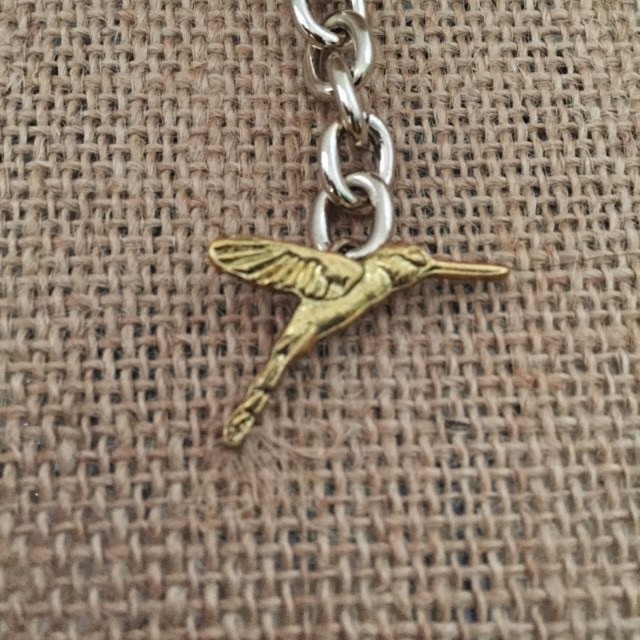 I'm so glad you included the mockingjay on my charm bracelet. It reminds me to constantly spread my wings, explore and fly! I love the Hunger Games and this is a wonderful representation. 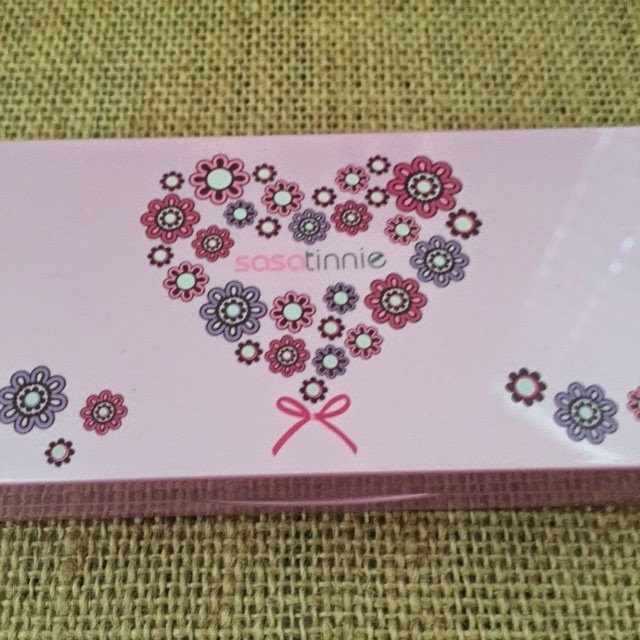 I purchased my first Anna Sui cosmetics this past Christmas. I saw her mirrors and wondered about them. This is so cute! 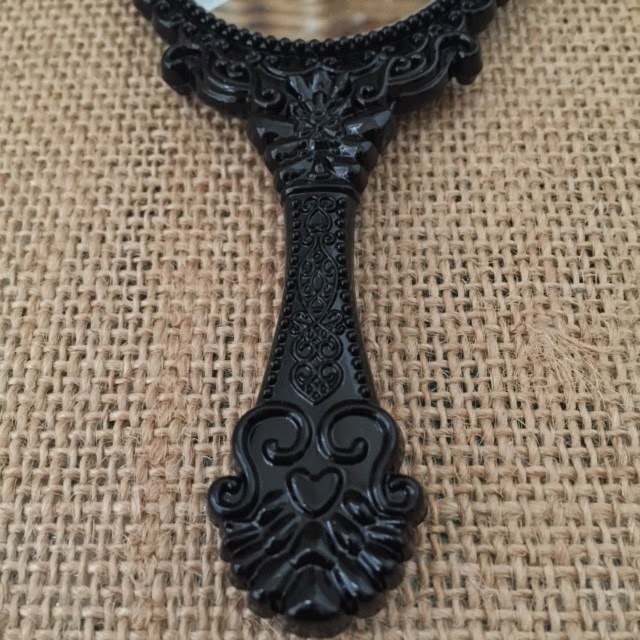 I love the intricate details on the mirror, and now when I need a close up up my face I have this to look into. Very nice. Thank you! 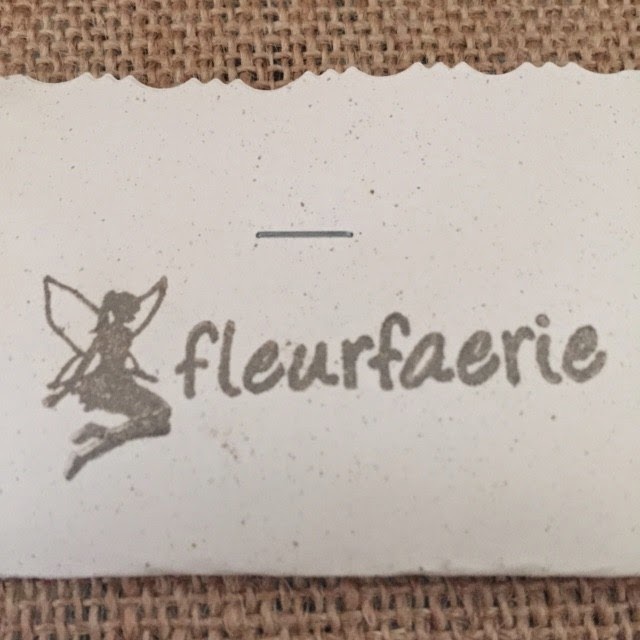 The clothes and accessories on your website Fleurfaerie are so beautiful Jo. 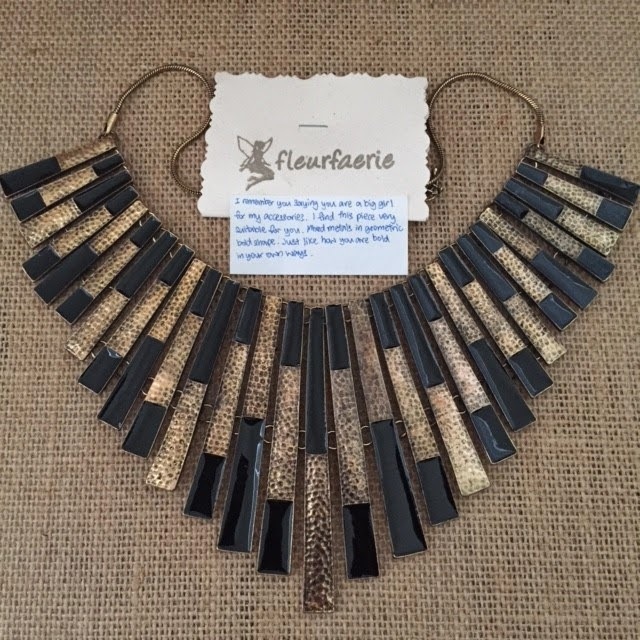 Thank you for this beautiful statement necklace. I'm going to pair it with a black dress. 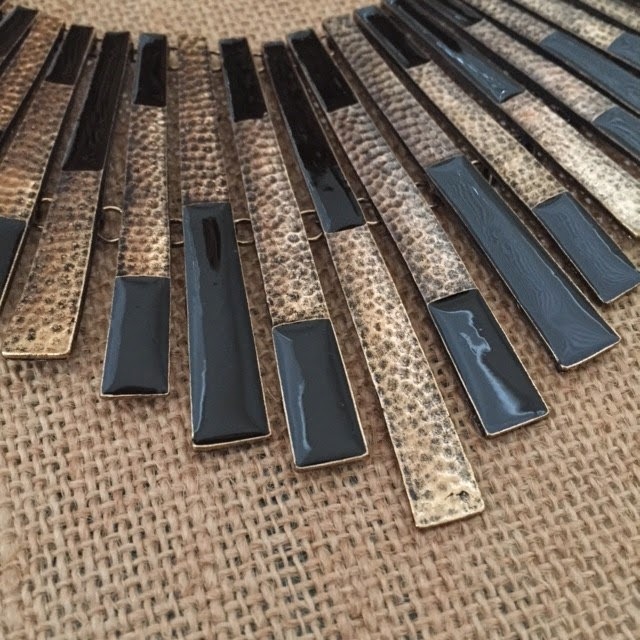 It's very striking and I can't wait to wear it. Plus, we wear a lot of black & gold here in New Orleans! That's our football team's colors! Thank you! Thanks so much for everything Jo! I want to put a package together for you! Don't worry, I'm a procrastinator too! HaHaHa But I never forget! Will have one for you! 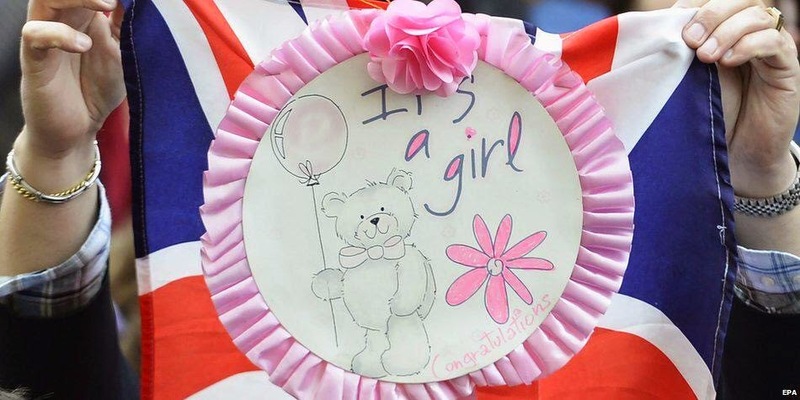 The Royal Baby is a Princess! I was one of the ones waiting in anticipation to hear what Kate and William were having! I was so happy they had a girl. I do think they'll have a third child! I hosted a Too Faced Sugar Pop Eyeshadow Palette Giveaway on Instagram. 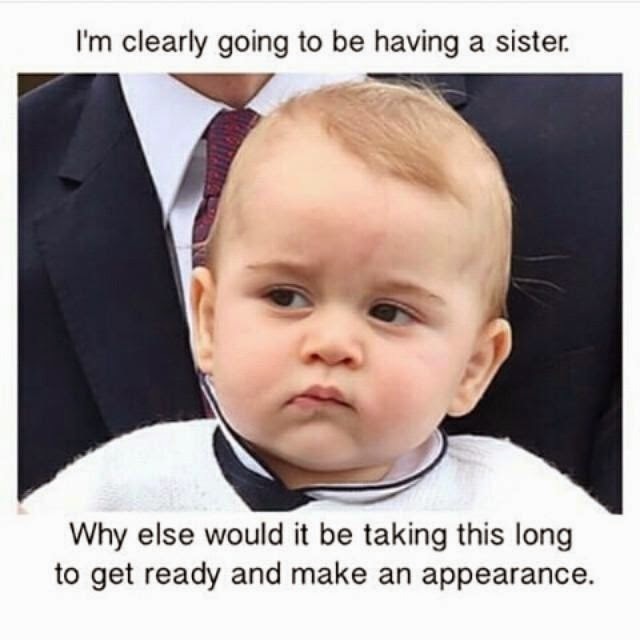 I simply asked readers to express whether Kate would have a girl or boy. It was fun! So the winner is Angela L! Congratulations and I thank everyone that participated! My next giveaway will require being a follower on Twitter. Join me on all social media. You never know when I'll pop up and do a giveaway! Here are some random funnies. Have a great Sunday. So much excitement over the royal baby - I don't really get it but I never really got it last time around either. I will say it's good to have a good news story though, isn't it? :) So it's wonderful in that respect. Is special when someone take time to write a letter and it comes from the heart very sweet to get a parcel like that. I get letters and I enjoy reading one from London came with a candle, one from Canada came with a gold necklace and one from India came with the lip clips that match my blog I was more excited about the letters reading and learning about the person and how they take the time to think of you. Great post and hurray the princess have a little who could carry her throne. 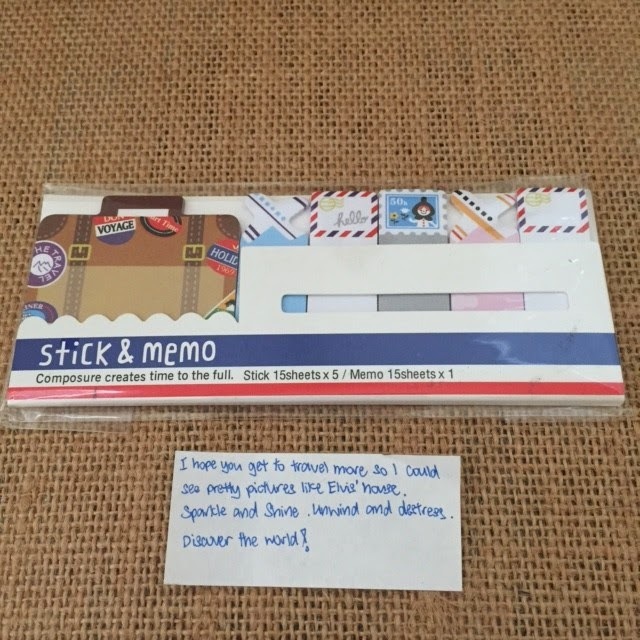 Such an awesome package you received! 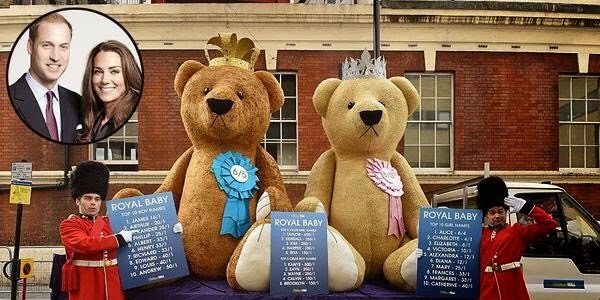 Can't wait to find out what the name will be of the royal baby! I swear I spent lots of time reading this post. 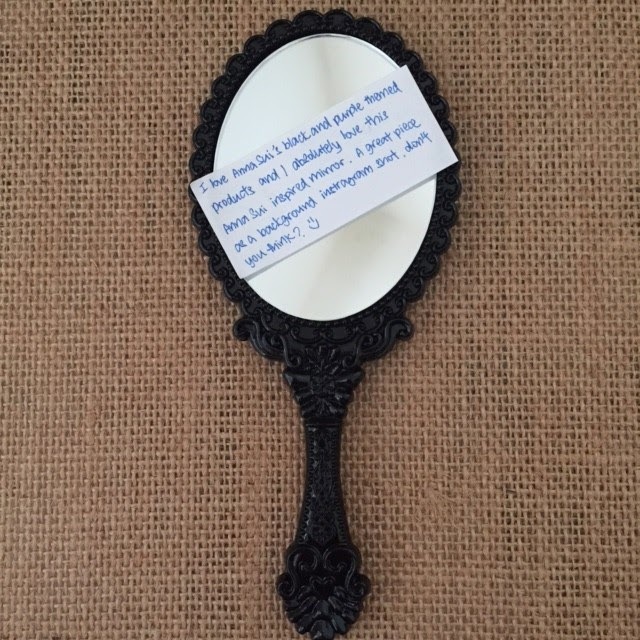 While the little notes explain the meaning of each item FROM ME, conversely your words and elaboration made me feel as if I've gone into your mind to really understand the significance each item held FOR YOU. It's a 2-way thing and I'm really very touched by your words. There are certainly some things I knew you like, Alice in Wonderland is one dead give-away; whoever reads your blog would definitely know this. It is a favourite for the both of us. And there are some which I was surprised. An eg would be the meaning you held for the mocking jay and that black and gold are the colours for New Orleans football team. It made me smile to read all these. I'm so happy to hear that you like what I've put together. And I know I've said this before and I would still seal it in memory on this post. How I wished I had a bigger box to include all my favourite Asian snacks for you. I know you would love those. Prince William and Kate Middleton is one of my favourite couples. I still like to call her Kate coz she's down to earth just like that. She is so very beautiful inside and out and how I love her hair! I'm so happy that they've got a boy and a girl now. That to me is my ideal family though of coz the gender doesn't matter and what matters is that mother and child are healthy. Wow, Jo is so kind and generous. Her fits are magnificent but most of all her 7 pages letter is just fantastic! You are lucky to have her as your friend. 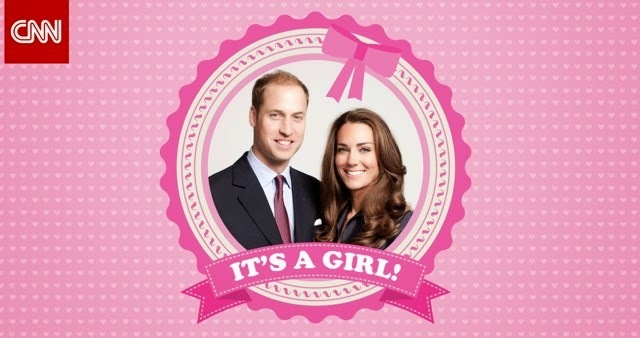 I'm thrilled with the birth of a new Princess for William and Kate. Truly wonderful news this weekend! It is so nice to meet good people like Jo through blogging!! sometimes people just comment to mostly promote their blog, but i do believe that a real friendship can happen through blogging!! Jo is amazing! I've connected with her some time ago, we are friend on Facebook as well and I always enjoy seeing her nice comments either on my blog, or on my FB account. 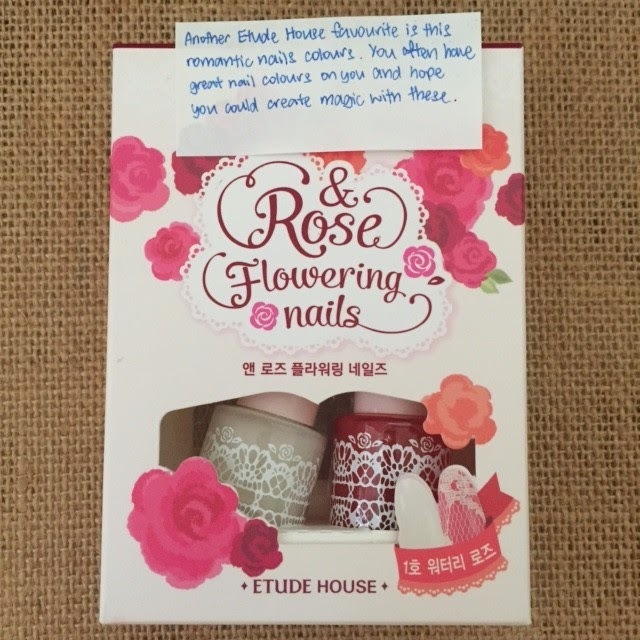 She is so kind and this is a wonderful gesture of her to send you this lovely package! Hey, Jo, you are amazing (if you are reading this)! Well done, girls! Jo is a sweetheart, I love her blog too! 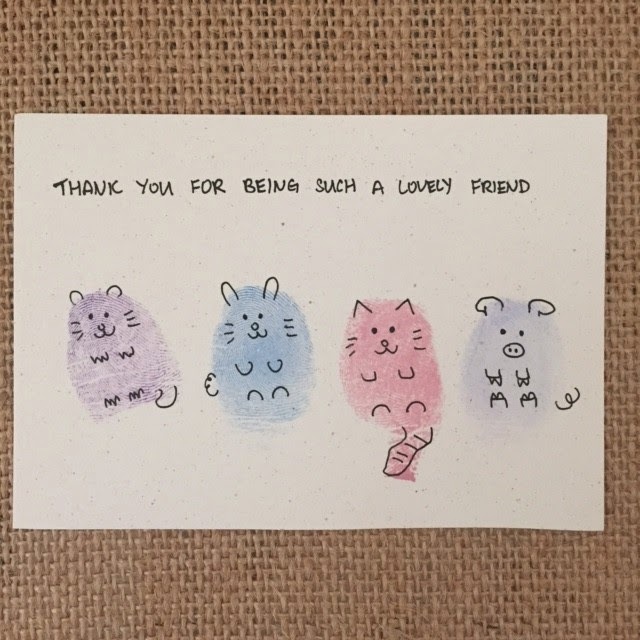 so lovely she send this to you...and that hand written message really makes a difference. The last hand message I got was a few days ago, a card my husband gave me for my birthday. The message is not very long but it means a lot to me and it made me happier than any present would have had. Handwritten notes are extremely rare in this age of technology/smart phones. It's a really sweet parcel! That is such a beautiful care package! I absolutely love receiving items from around the world. Those lashes look absolutely stunning! This is so sweet! Mail is too often forgotten, so we miss out on personal touches like this. It really made me smile to see all the care that went into this! P.S. Enter to win a teeth whitening kit in my giveaway! 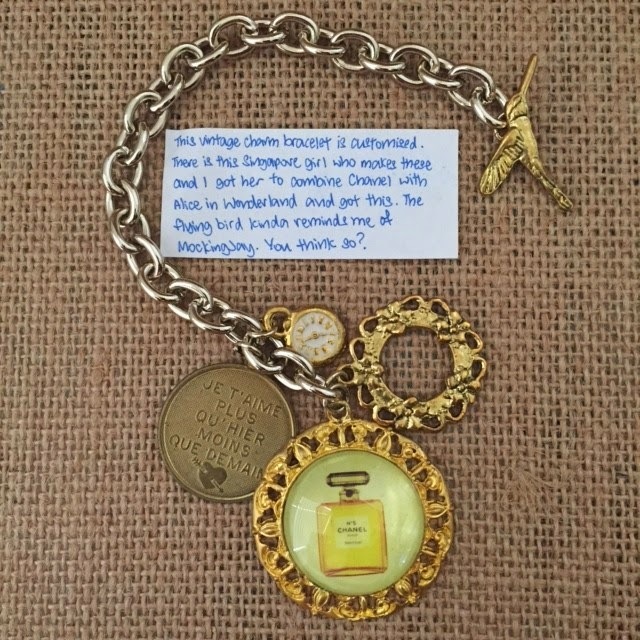 The thoughtfulness of this package is truly incredible and your description of her blog makes is sound like one I would definitely want to read. I will be hopping over there after this comment. I also want to say thank you again for the Too Faced Sugar Pop Palette. It looks so sweet and colorful! I found out Kate had a girl Saturday morning and was so excited to be in the running and also because Saturday was a belated celebration of my birthday on 4/28. My husband took me to a fancy English-style tea room where I had my first "afternoon tea" with all the little sandwiches and treats. It was absolutely wonderful and I look forward to returning. Getting chosen for the palette was just the best addition to an already great week/weekend. Thank you ×1000! 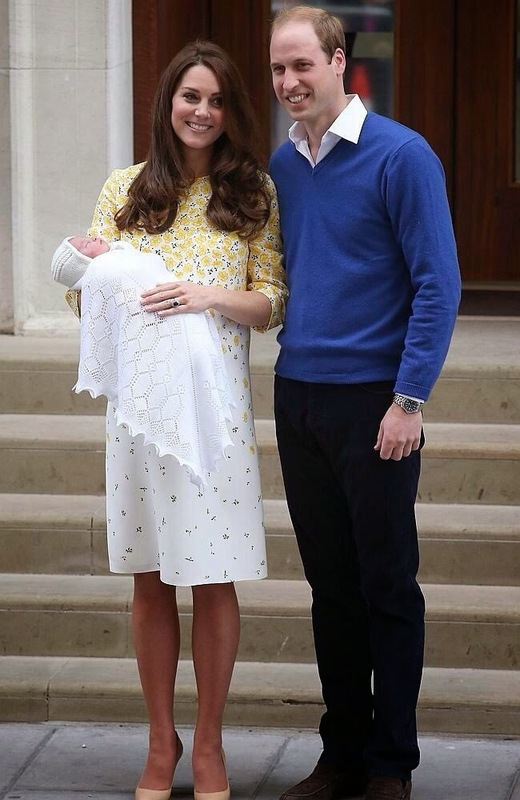 I cannot believe I had to learn from you that Kate had a baby girl! *covers face* shame on me. Pretty soon I won't even recognize Beyoncé's baby girl:-) what's her name again? That's what I get from staying away from TV! Anywho, I visited Jo's blog, and I must agree with you, she is a sweetheart. And you, my friend, have a gift! The way you connect with people is incredible. I love your presents, Kim! And I'm jealous with a capital J😀. Happy new week love! You got a ton of great new goodies! 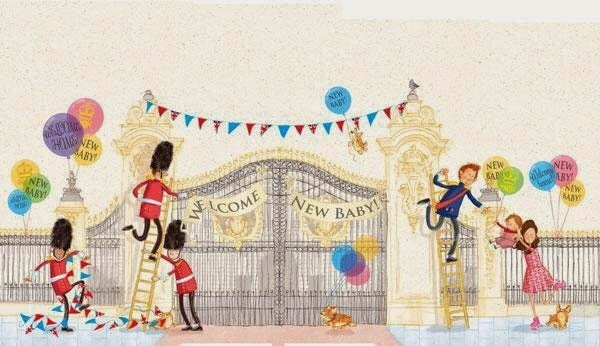 I am so excited about the royal baby, too!! 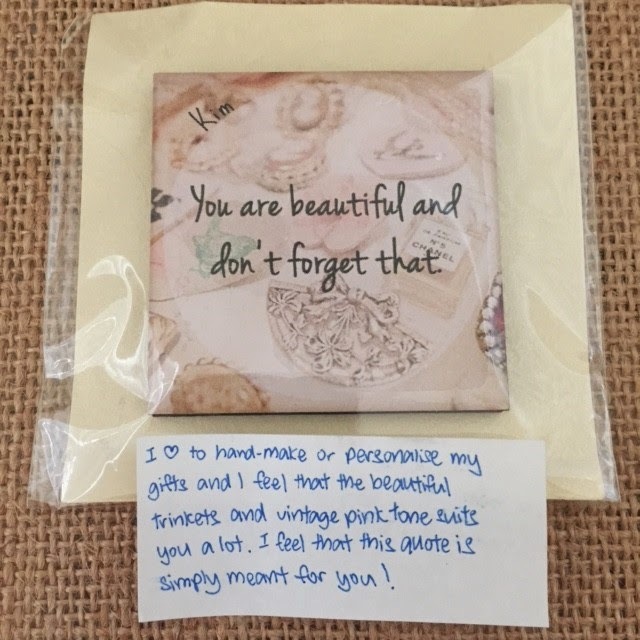 It doesn't surprised me for the fact that you have always received thoughtful packages from people around the world. You are loved, Kim. Everyone love and admire your thoughtfulness, kindness and sincerity. Jo is a wonderful person and her blog has always been a great read. Ohhh, that is soooo sweet of Jo! And I agree with everything you say about her and her blog, Kim. She is as genuine as they come and her blog is the real deal. It's all about writing, pictures and beautiful memories. I love everything that she sent you and she's a really lovely friend. Wow! What a great gift to receive and I love the fact that she wrote you a 7 page letter describing the meaning of each gift. I imagine it makes everything that much better! I will definitely be heading over to Jo's blog today! How very thoughtful of her ! 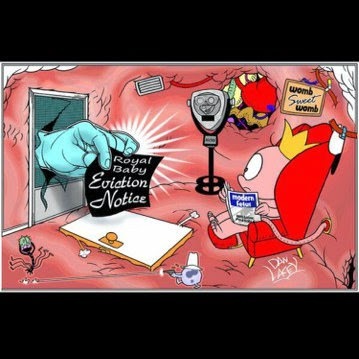 Its so nice of her to take time and put this together for you :) Enjoy !! Hope you had a lovely weekend. Personally I was so behind the times... somehow I did not know another royal baby was on the way. Totally embarrassing! Hahahahaha, I've never been accused of keeping up with the news, that's for sure. 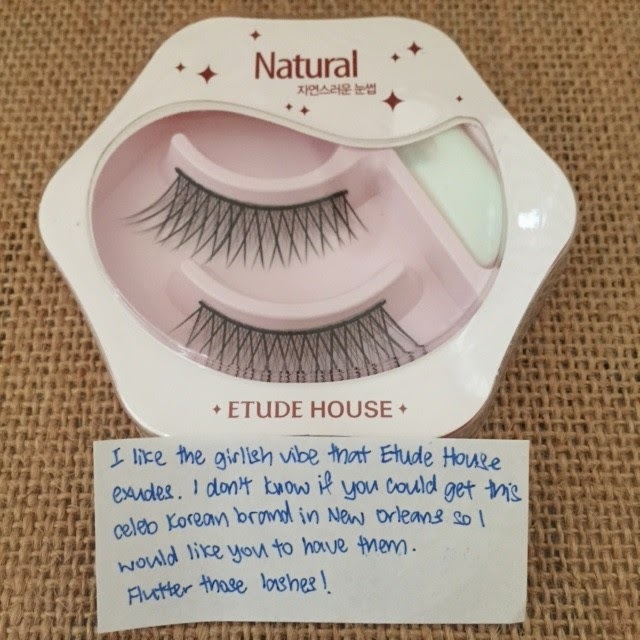 I think you're going to love false eyelashes. They are a pain when you first try them, but once you're in the swing of it there is nothing more fun! It's the perfect added oomph to a night out. 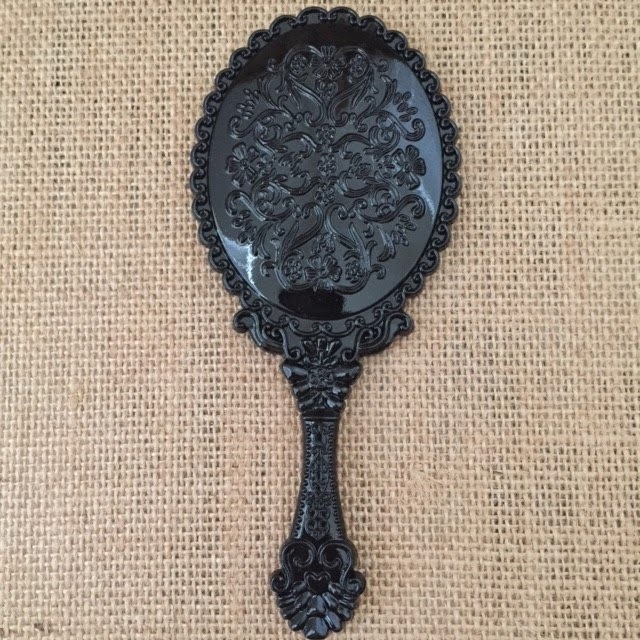 What a beautiful and thoughtful gift from your friend. It's true that that level of care and thoughtfulness is so rare these days. 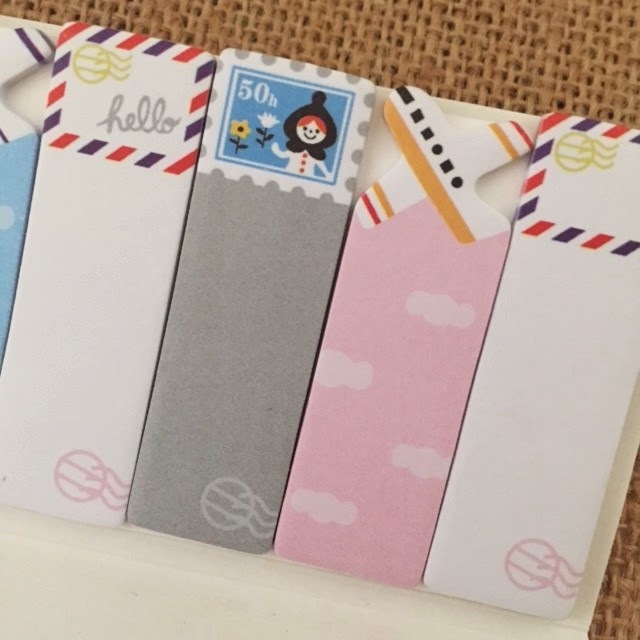 That stationary is so cute! 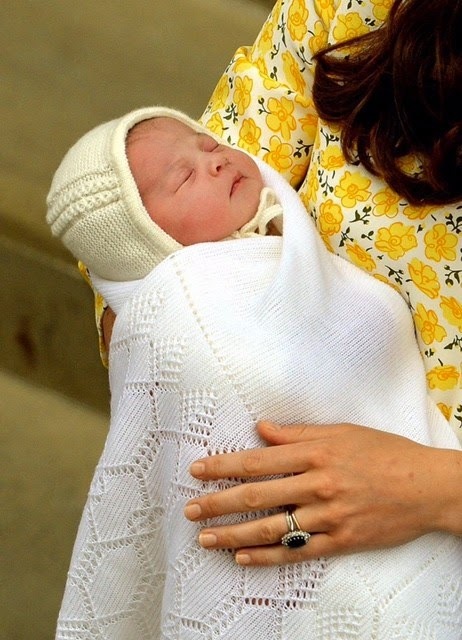 The royal baby princess is adorable! Kim, this is so fabulous! Jo is wonderful and the fact that she hand written you a letter. I'm so jealous. I haven't receive a real letter in a loooong time. I can tell she is very considerate. Congrats to knowing another awesome blogger friend! And I love Kate's daughter and the name too! I'm still wondering how in the world does she look like that after labour?! Such an beautiful woman! Also, I can't believe you never tried falsies, I bet you have long lashes. Hope all is well! Keep in touch. 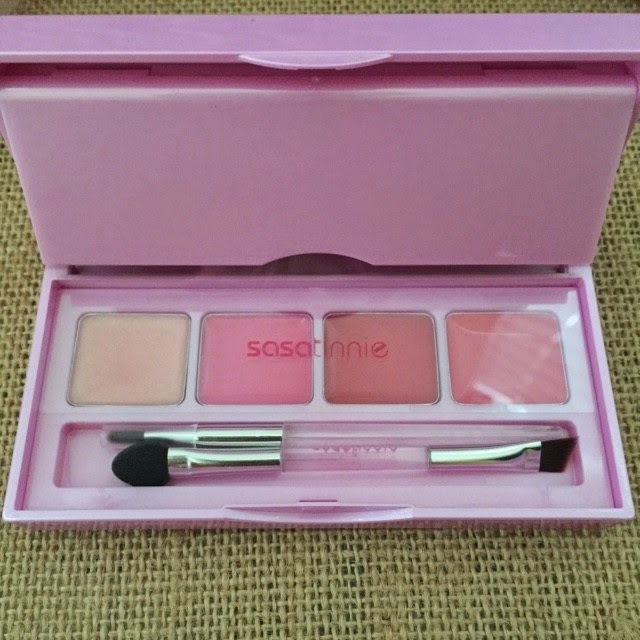 Few nice things, I liked the mirror, I have not ever used false eyelashes should try one days! Jo is such a thoughtful friend. I will surely give her blog a visit. I started blogging inspired by reading blogs like the one you described. Love following along a person's life story. Thanks for sharing! 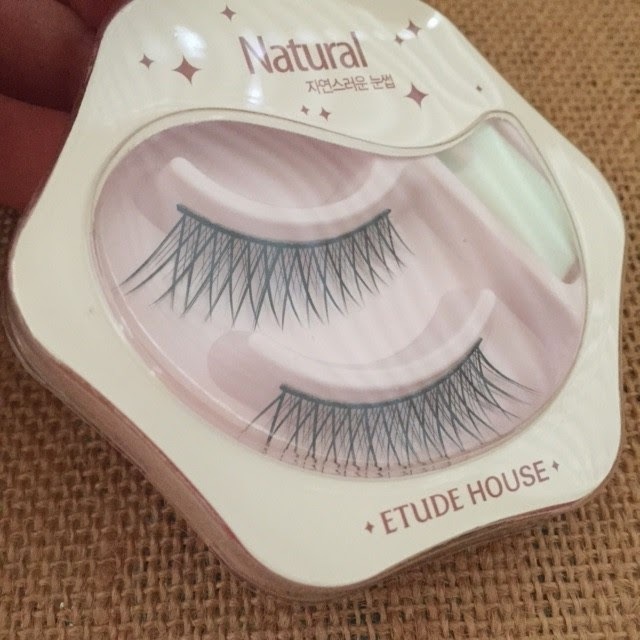 excellent package...as a wearer of false lashes, i'm loving these etude lashes. i love writing and receiving hand written letters. i currently have a few pen pals. What a lovely post Kim! 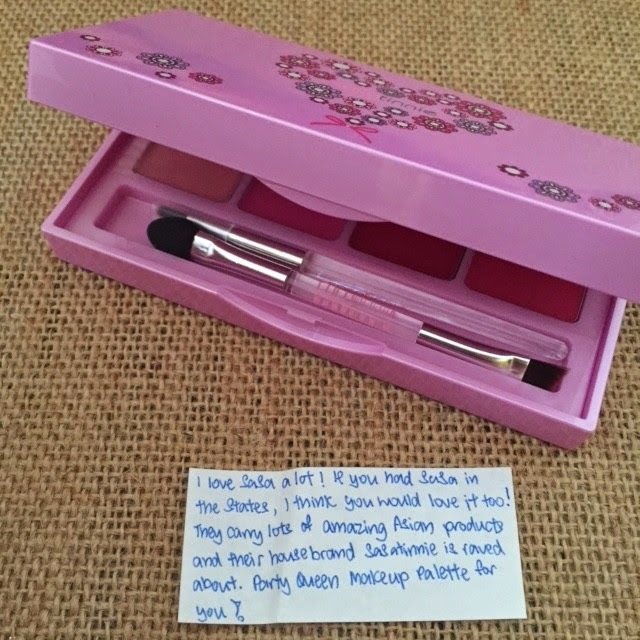 That was so thoughtful of your friend to send you this package and a handwritten note! So glad I found you and this post in particular world has changed in good and bad ways. I am glad you were able to find a someone that is still an authentic blogger. I'm going to check out Jo now! What a wonderful package! That Anna Sui mirror is beautiful. I'm looking forward to your review on the Party Queen Makeup Palette too. If it's good, I'll have to scoop one up for myself!